One Network Upgrade covers all programs within Payroll System. Quick and simple way to submit W-2 information to Social Security Administration and 1098/1099 information to IRS. Paperless filing of W-2's for SSA and the following states: AL, AZ, AR, CO, CT, DE, DC, GA, IA, ID, IL, IN, KS, KY, LA, ME, MD, MA, MI, MN, MS, MO, MT, NE, NJ, NM, NC, ND, OH, OK, OR, PA, RI, SC, UT, VT, VA, WV, and WI. States subject to change. Paperless filing of 1098, 1098-T, 1099-A, 1099-B, 1099-C, 1099-DIV, 1099-INT, 1099-MISC, 1099-PATR, 1099-R, 1099-S, and 1099-SA for IRS and the following states: AZ, AR, CA, CO, CT, DC, DE, GA, IA, ID, IN, KS, KY, LA, MA, ME, MD, MI, MN, MO, MS, MT, NE, NJ, NM, NC, ND, OH, OK, OR, SC, UT, VT, VA, WV, and WI. States subject to change. Paperless filing of W-2cs (corrections) for SSA and certain states, as permitted by the state. See the program Help file for the currently supported states which is subject to change. Paperless filing of extension Form 8809. Includes IRS forms 4419, 4804, 6847, 8508 and CA forms 3601, 4092, 6274, 4092A and 6274A. Ability to send either multiple employers or multiple payers. Includes "Accuwage" software which checks your W-2 file for basic errors before you send it. Ability to test the entire record before e-filing. Ability to print a summary for each employer/payer. 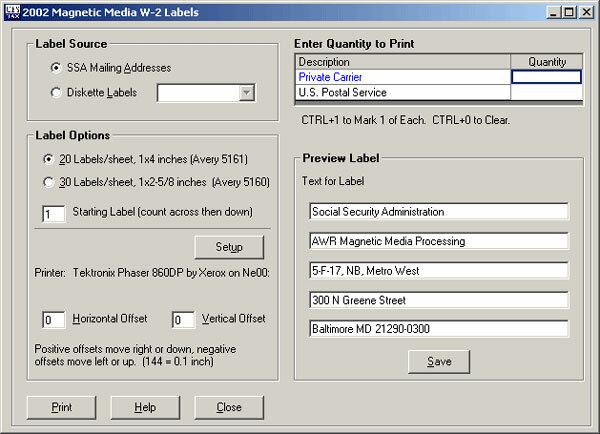 Eliminates printing and filing of red forms. W2/1099 E-File add-on ™ is released before the start of each year. Each program can be purchased separately or as a suite (call 800-343-1157 to order). Choose the program combination that is right for your firm's payroll needs. Paycheck information entered into the 941/940 ™ accumulates and transfers to the W2/1099 ™. Should it be necessary to do a corrected return, 941/940 ™ and W2/1099 ™ data transfers to the Payroll Corrector ™.